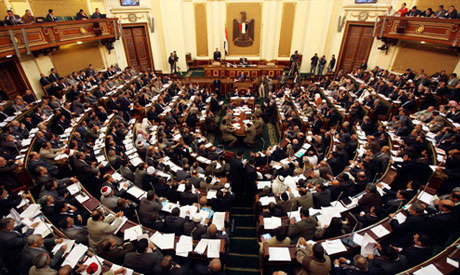 Egypt's parliament – the House of Representatives – will convene Sunday to discuss new government-drafted amendments of two laws regulating "Supply Affairs" and "the Protection of Competition and the Prevention of Monopolistic Practices." A report prepared by the Legislative and Constitutional Affairs Committee and the Economic Affairs Committee said the new amendments of the two laws are necessary to contain the phenomenon of high prices, particularly those of goods and products essential to ordinary citizens. The report said the first is an amendment of the law decree (no.95/1954) regulating Supply Affairs and the second is an amendment of the law (no.3/2005) on the Protection of Competition and the Prevention of Monopolistic Practices. According to the report, "there is a pressing need right now to change the above two laws not only to go in line with the new economic developments in Egypt, the latest of which is the signing of an economic reform agreement with the IMF and the floatation of the Egyptian pound in November 2016." "The philosophy of the new amendments also come to stem the tide of high prices on the local markets in an exaggerated way," said the report, adding that "the flotation of the Egyptian pound and the elimination of a large part of fuel, power and drinking water subsidies led to the proliferation of monopolistic practices and the manipulation of essential products on the local market." As a result, said the report, the new amendments come to stiffen penalties on merchants and traders who exploited the liberalization measures to manipulate prices and double their profit margins without fear of facing adequate legislative retribution. "Watchdog authorities have noticed that a handful of importers and merchants who exploited the liberalization policies to double their profit margins in an illegal way and exaggerated way," said the report, indicating that "the amendments give greater powers to inspectors affiliated with Ministry of Supply, the Consumer Protection Apparatus, and the Ministry of Interior's Supply Control Department to help them discipline the local market, contain high prices, ensure that limited-income consumers get essential goods and products at reasonable prices, and tighten the grip on monopolistic practices." "These powers are necessary to protect consumers from the greedy practices on the market and to send them a message that the government cares about them and that it is there to safeguard them against those who manipulate the prices of their basic needs of products and goods," said the report. It also argued that the above legislative initiatives come as a response to parliament and MPs who have always pressurized the government to check monopolistic practices and give consumers all the protection needed. "While citizens recognized the importance of reform measures to the country's economic future, it is now the government's duty to do its best to protect them against the vagaries of this reform," said the report. The report indicated that article 3 of the 1945's law decree on supply affairs will be amended to toughen penalties on a new crime, which is hiding some strategic goods such as supply and petroleum products ready for sale. "Those who will hid such items, or do not put them for public sale, or abstain from selling them, or decide to sell them only under certain unlawful conditions, will be fined an amount ranging from EGP 100,000 (instead of EGP 10,000) to EGP 1 million (instead of EGP 100,000)," said the report, indicating that "if offenders committed the same crime again, they would be sentenced to a prison term ranging from five to ten years, and fined from EGP 200,000 to EGP 2 million, and that their trade license would be repealed." The report indicated that a new article (Article 22) will be added to the 2008's Law on the Protection of Competition and the Prevention of Monopolistic Practices to incriminate those who violate the cabinet's decisions related to fixing the price of certain basic goods. "Those who violate such decisions will be fined an amount ranging from EGP 100,000 to EGP 5 million," said the report, also indicating that "the cabinet, in addition to prosecution authorities, will be both entitled by the new amendment to refer offenders to justice." The report cited Mona Al-Garf, head of the Consumer Protection Apparatus, as saying during the committee's meeting that "the new amendments are necessary to create a new legislative environment favourable to economic activities and healthy competition." Meanwhile, parliament's economic affairs committee will hold two meetings Sunday morning. Head of the committee Ahmed Samir said the first one will be devoted to discussing four "information requests" about the government's new privatization programme. The requests are submitted by four leftist deputies who cried foul that the sell-off programme leads to privatizing a number of strategic national banks and public sector companies. Samir said the second meeting will see Minister of Finance Mohamed Maeet deliver a statement about Egypt's economic conditions in the last six months, and the progress on the implementation of the government's policy programme delivered before parliament last June.